Please join us for presentations and conversation with our panel of distinguished speakers. 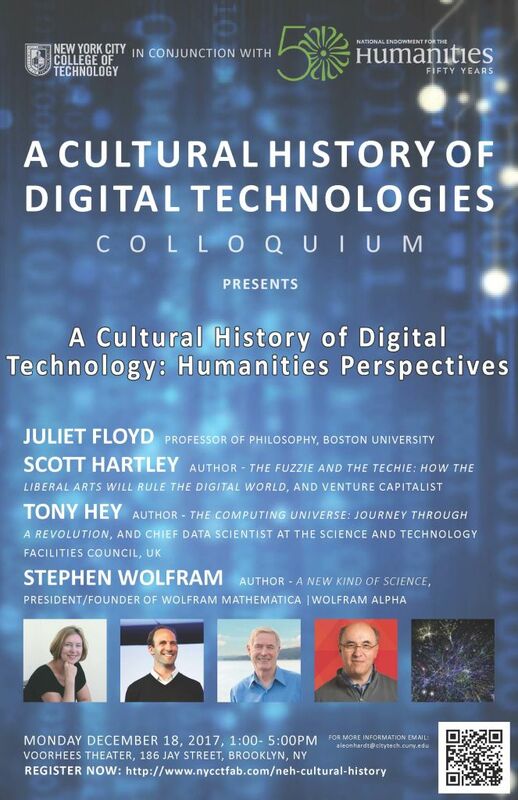 This event is hosted by the College and the National Endowment for the Humanities Grant A Cultural History of Digital Technologies. Professor Juliet Floyd is Professor of Philosophy at Boston University, and a philosopher of logic, mathematics, and scientific method. She received her Ph.D. from Harvard University and is Associate Senior Editor, Twentieth Century Philosophy, The Stanford Encyclopedia of Philosophy, and co-editor of the book Philosophy of Emerging Media: Understanding, Appreciation, Application, and Philosophical Explorations of the Legacy of Alan Turing. She also is co-directing a Mellon Foundation, the Sawyer Seminar grant, Humanities, and Technology at the Crossroads. Professor Tony Hey is a Senior Data Science Fellow at the University of Washington eScience Institute and Chief Data Scientist at Science and Technology Facilities Council, UK. He was Vice President for External Research at Microsoft and has worked at CERN in Geneva, Switzerland, and the University of Southampton, CalTech. He holds a Ph.D. from Oxford University in Theoretical Physics, from which he went on to a Post-Doctoral position at CalTech and then worked at Los Alamos National Laboratory. He is also author and co-author of a number of books, including The Computing Universe: Journey through a Revolution, The Quantum Universe, The Feynman Lectures on Computing, and Einstein’s Mirror. Scott Hartley is a venture capitalist and author of the book The Fuzzy and the Techie. He has degrees from Stanford and Columbia University, and has worked with Google, Facebook, Harvard’s Berkman Center for Internet & Society and is a former partner at Mohr, Davidow Ventures. In addition, he has served as Presidential Innovation Fellow at the White House. Dr. Stephen Wolfram is a British-American computer scientist, physicist, and businessman. He is known for his work in computer science, mathematics, and theoretical physics. He has a doctorate from Caltech, and is the inventor of Mathematica, software for automating calculations and Wolfram|Alpha a knowledge engine that lays behind Siri and other AI interfaces—which is seen as a new interface for computation that will enable humans and machines to interact at a vastly richer and higher level than ever before. He is the author of A New Kind of Science, published in 2002—where he calls for a revolution in traditional mathematical methods. Tuesday, October 24, 2017, from 1:00 – 2:20 p.m. in the Faculty Commons. Humanities Connections, a new NEH grant opportunity, seeks to expand the role of the humanities in the undergraduate curriculum at two- and four-year institutions, offering students in all academic fields new opportunities to develop the intellectual skills and habits of mind that the humanities cultivate. Grant projects focus on connecting the resources and perspectives of the humanities to students’ broader educational and professional goals, regardless of their path of study. Through this new grant program, NEH invites proposals that reflect innovative and imaginative approaches to preparing students for their roles as engaged citizens and productive professionals in a rapidly changing and interdependent world. Grants support the development and implementation of an integrated set of courses and student engagement activities focusing on significant humanities content. A common topic, theme, or compelling issue or question must link the courses and activities. The linked courses (a minimum of three) may fulfill general education or core curriculum requirements but could also be designed primarily for students in a particular major or course of study. The Humanities Connections program gives special encouragement to projects that foster collaboration between humanities faculty and their counterparts in the social and natural sciences and pre-service or professional programs in business, engineering, health sciences, law, computer science, and other non-humanities fields. Humanities Connections projects have two core features: 1. faculty from at least two separate departments or schools at a single institution must collaborate to devise new curricular arrangements; and 2. projects must include provisions for high-impact student engagement activities that relate directly to the topic(s) of the linked courses. These activities could include individual or collaborative undergraduate research projects; opportunities for civic engagement; or a structured experience with community-based, project-based, or site-based learning. Community organizations and cultural institutions can play key roles in this regard. Awardees may use grant funds to engage faculty in joint study, bring in outside experts, organize seminars on substantive issues, and bring relevant parties together to plan the student engagement. Funding of $100,000 is available for a grant period of 18 months to three years. encourage student engagement through structured opportunities for undergraduate research or experiential learning. Present the Intellectual Rationale: What topic will the project address? How will you involve two different schools or departments? Why is it a significant topic in the humanities? How will it advance the academic mission of City Tech as a college of technology? Identify the three courses into which this content will be integrated. Identify the leadership team and qualifications related to the topic. Describe the key student research or experiential learning opportunities. Identify relevant cultural or community resources to be engaged. Submit the concept paper to Barbara Burke, Director of Sponsored Programs bburke@citytech.cuny.edu no later than Wednesday, September 7th. An internal review committee will select one concept paper for further development and will notify the proposers no later than Tuesday, September 13th. The NEH deadline is October 5, 2016 for projects beginning in May 2017. The full solicitation can be found below. 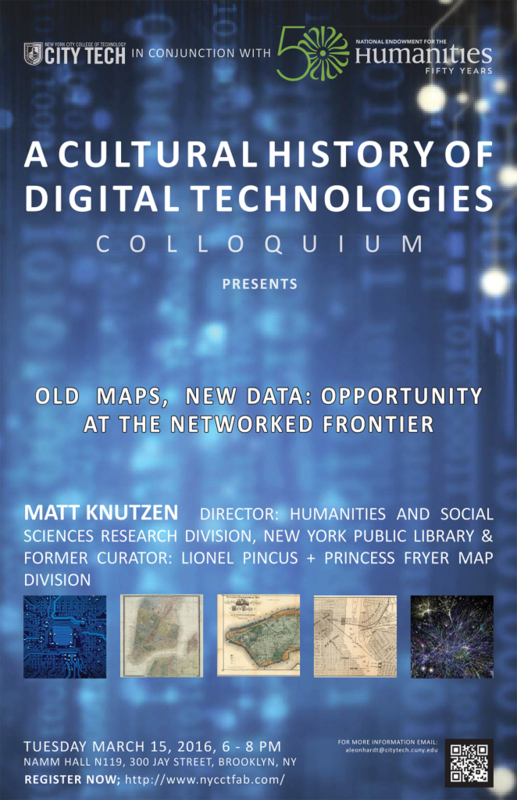 [icon name=”at” class=”” unprefixed_class=””] For more information: Please contact aleonhardt@citytech.cuny.edu. 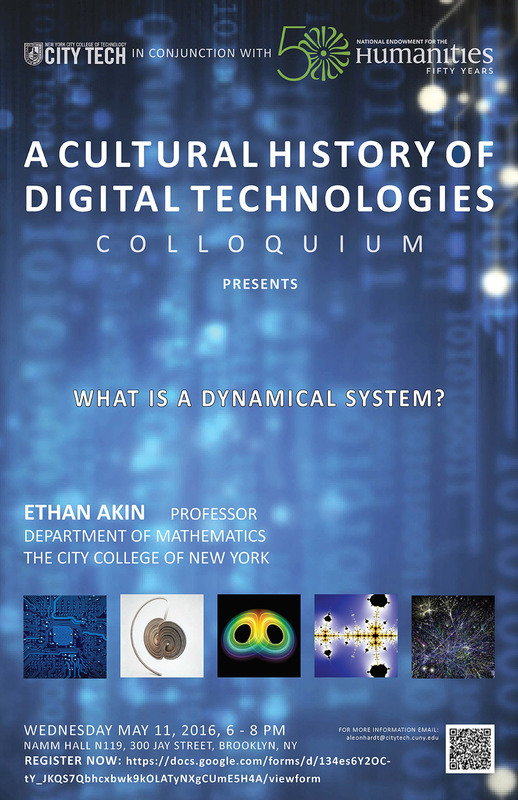 Dr. Akin is Professor of Mathematics at the City College of New York, CUNY. He focuses on the topological part of dynamical systems theory and is the author of two books, The General Topology of Dynamical Systems(1993) and Recurrence in Topological Dynamics: Furstenberg Families and Ellis Actions (1997). 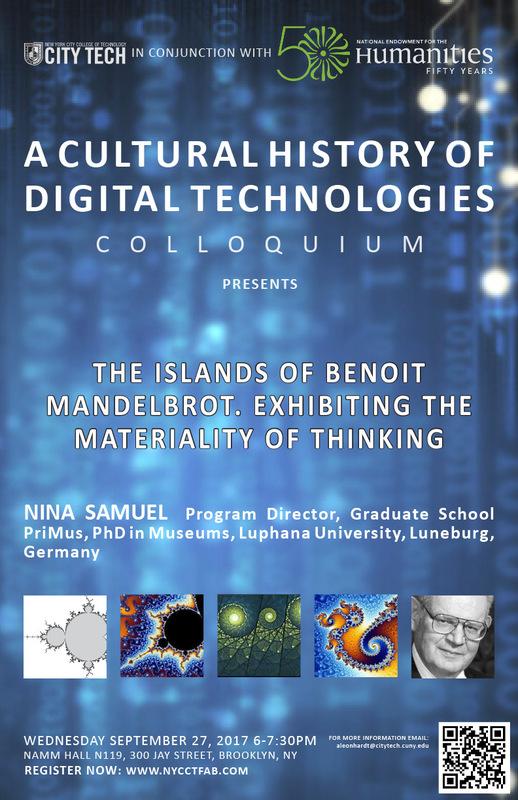 Will discuss how electronic developments in the health care fields relate to the ways that doctors and nurses think about and tell stories about their patients.